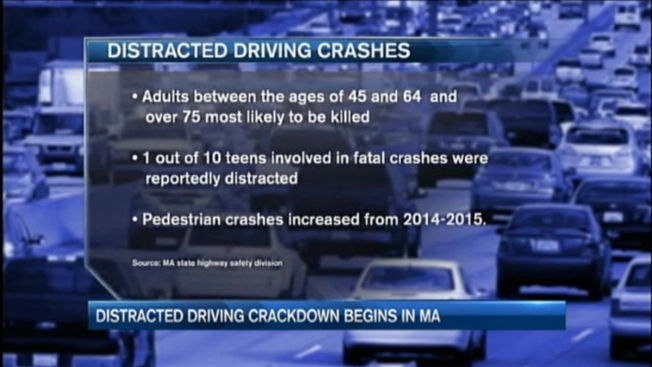 Police across Massachusetts are stepping up patrols in an effort to stop distracted drivers. State and local police in more than 140 cities and towns will be on the lookout for those who text, or check their email while behind the wheel. The effort is part of a national campaign called "U Drive. U Text. U Pay." In Massachusetts it is illegal to write, send it read electronic messages on your mobile device while driving or stopped at a light or in traffic. Between 2010 and 2013, 184 people in Massachusetts died in crashes that were caused by distracted driving. In fact, the Massachusetts State Highway Safety Division says adults between the ages of 45 and 64 are most likely to be killed in a distracted driving crash. One out of ten teenagers involved in fatal crashes were reportedly distracted during the crash. Teen drivers are prohibited from using mobile devices while driving. If caught, a teenager could lose their license for up to a year. And fines for all drivers could reach $500. The increased enforcement will last through the end of the month.